My motivation for the reduction was all the projects I see around the house and on my home office desk that never get done. But Mauri wanted me to just take it easy that first day off, even asked what he might do that could make it special. So toward the end of the day we walked downtown and split a sandwich and some truffle fries at Jac’s then walked across the street to wait in the front of the Cameo (historic theater) for the ticket window to open. $5 seats for seniors to see a first-run movie! If you get in early enough you can choose between several rows of loge seats that rock and a pipe on which to rest your feet. 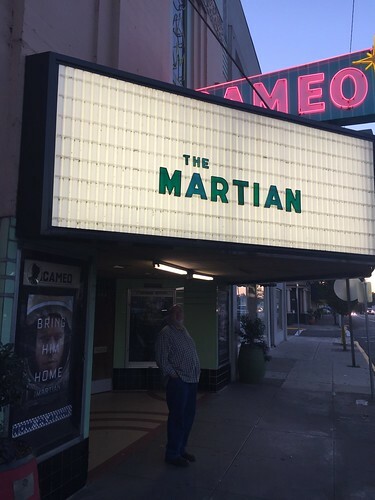 We were two of about 10 people who showed up to see “The Martian,” so going early was a moot matter. We really enjoyed the movie and stuck around to watch till the end of the credits. 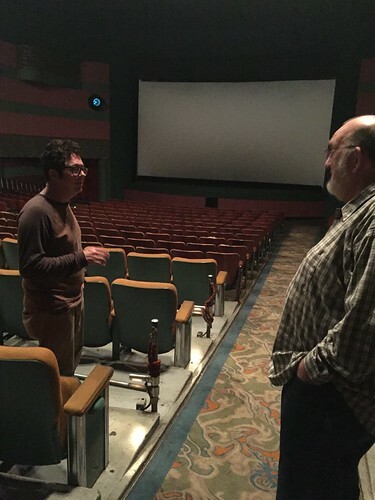 Meanwhile the theater emptied and we were left with only Brian Francis, the owner, who was eager to talk about a short clip that he digitized to play at the end of the film encouraging movie watchers to drive safely on the way home. So we were glad we stayed to the bitter end to give him some personal satisfaction. Then we walked home in the dark, satisfied that my first day of sort of semi retirement had been good.